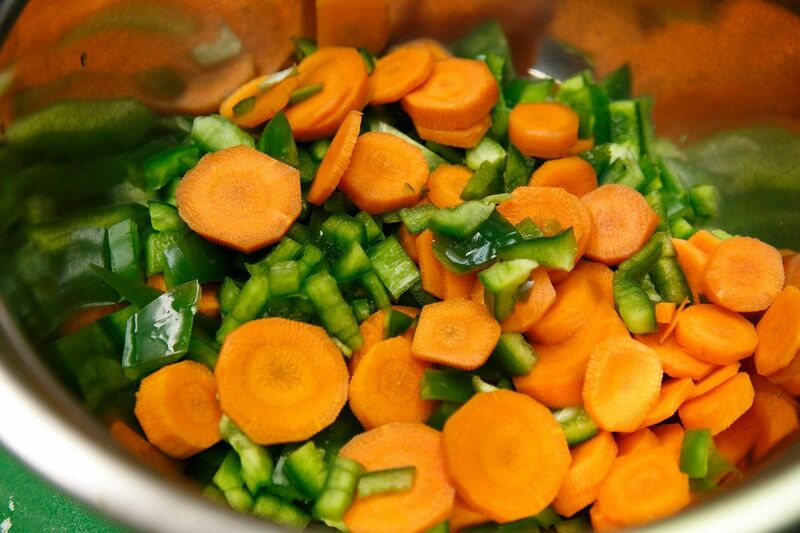 A bowl of vegetables prepped during a Health Promotion Council seminar, where instructors work on healthy cooking with cooks on staff at city agencies and city-funded programs. At a kitchen in North Philadelphia, eight chefs from six shelters around the city gathered to learn about healthy cooking. Topics at the Health Promotion Council's Nov. 30 session included the amount of sodium in a classic turkey-and-cheese sandwich, the dangers of trans fats, and the benefits of fruit and herb-infused waters. "Nobody's ever going to tell you not to put more vegetables into your food," said session leader Bryan Schmidt, program coordinator of the council. "They have a small amount of calories, lots of nutrients, and they bulk up the fiber content." The City of Philadelphia is responsible for some 20 million meals a year, and what its agencies, organizations, and lunchrooms serve has a huge public health impact. In 2012, then-Mayor Michael Nutter signed a bill to improve the nutrition standards for all city-funded food service as part of the Get Healthy Philly Initiative. "Philadelphia has one of the highest rates of diseases like diabetes, heart disease, cancer, and stroke among major U.S. cities. The standards are designed to address that," Schmidt said, citing Los Angeles, Boston, and New York as cities that have established similar initiatives. The standards apply to any food-service facility that receives funding from the city, such as shelters, municipal office buildings, transitional housing, juvenile justice, the Sheriff's Office, vending machines, elder care facilities, and more. In some organizations, that might mean two to three meals a day plus a snack. Though enforcement was not built into the standards, the council, a subsidiary of the nonprofit Public Health Management Corp., was contracted to help sites implement needed changes, working with the Philadelphia Department of Public Health with funding from the Centers for Disease Control and Prevention. The standards already have changed foods procured for the city, eliminating trans-fat margarine and high-sugar yogurt, for example. Gone are frozen cheesesteaks and fried chicken. Meeting the standards also requires fundamental changes in food preparation, which means training sessions like the November one. "It's great to say, 'Eat more fruits and vegetables,' but if your clients don't have access to them or know how to prepare them, you're not going to be able to change much," said Michelle Gross, the council's program manager for nutrition and active living. "It's about changing the way people cook; encouraging habits like making food from scratch." The big-picture goal is systemic transformation, encompassing a wide swath of agencies and organizations. The reality, however, is that each organization has its own policies and procedures and long-entrenched attitudes about cooking and eating. "We can't work with every single organization, so we prioritize city shelters, juvenile justice, and homes for people 65 and older," Gross said. "We work to set goals and help the sites to incorporate more whole grains, for instance. We create tool kits, but we also provide technical assistance on the ground with individual trainings, and we find that the hands-on efforts have a stronger impact." The quarterly training sessions are open to all 30 agencies with which the council works, and participants attend on a volunteer basis. Schmidt, a classically trained chef with a degree in nutrition, starts with a PowerPoint presentation that reviews the pitfalls of the American diet and shares tips and tricks for healthier techniques, such as adding brown rice to a soup to improve fiber content and texture. In the discussion, participants talk about ways to make vegetarian meals more enticing, how to convince parents that their children might actually like dishes they've never tried, and how to introduce unfamiliar foods to clients, particularly in an abuse-shelter environment, where individual agency is encouraged and women don't want to be forced to eat anything. With a class theme of "healthy soups and stews," Schmidt demonstrates how to make beef and butternut squash soup, and then the chefs are invited to the test kitchen to try out recipes the council has developed in keeping with the standards. Working in pairs, they make potato and corn chowder with low-fat milk, vegan Southwestern bean soup, West African peanut stew with chicken, chicken and barley soup, vegetarian chili, and a deconstructed "stuffed pepper" soup with ground turkey. Later, the chefs sample their work. The training also serves as professional development for cooks who are learning on the job. As an incentive, they're offered equipment such as cutting boards, knives, and professional appliances for their sites. "Not everyone comes to these jobs with a culinary background. They can come and network with other chefs. They can practice new skills and learn about creative approaches from one another," Gross said. Participants take the lessons and the recipes back to their sites and adapt them to fit the ingredients they have and the audiences they serve, without veering away from the recommendations for fat, sugar, and salt content. For homeless shelters particularly, the barriers to healthier food have been a lack of nutrition literacy, client resistance to different foods, and a lack of ingredients. That has changed recently, said Liz Hersh, director of the Office of Homeless Services. "We're seeing more fresh fruit and vegetables, healthier meat and fish options, and the providers feel more supported," she said. "Everybody should have access to healthy food." Attendee and Salvation Army chef John Adamski, who has had an extensive culinary education, says that though the range of ingredients remains limited at his site, the session prompted him to think creatively about preparing vegetables in new ways. "The training is an opportunity to expand our recipe list and share ideas with other kitchen personnel. Our residents appreciate the variety [of dishes]," he said. "I always say that we're physicians in a sense. Food is medicine, and what we feed people is serious business."